Every gardener does so at some point of their gardening carrier. Because, greenhouses are a great asset, with no doubt. The best thing about greenhouses is, they let you garden every month of the year which is heavenly to a gardener. They also represent a considerable commitment in time, money and space. Greenhouses are ideal homes for your plants to protect themselves from too chilled weather that they don’t like. What greenhouses do is, they trap heat and humidity that the plants need, and make them feel home. 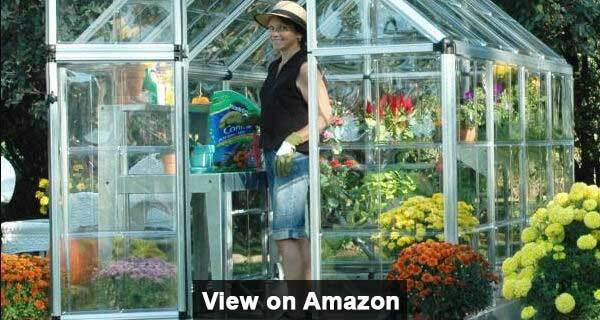 So, You’re Thinking About Purchasing the Best Greenhouse for your needs? GreenHouse Types – Which One Suits Your Requirement? Greenhouse Size: How much space do you need? What you’ll be using the greenhouse for? Final Words about the Best Greenhouse! Usually, greenhouses are used to protect the outdoor plants from a particular season. But they can also be used to transfer ‘indoor-raised warmth loving plants’ to outside, as they keep things warm. No matter which purpose you’d want to use your greenhouse for, you’d want to make sure you buy a good one that gets the job done for you. Here comes the tricky part, because choosing the best greenhouse for your needs is not a piece of cake. This is one hell of a tricky job since you need to consider a lot of things before making the decision. 2 Palram HG5508PH aluminum frame, polycarbonate covering 6' x 8' ft. The Virtue is the best one of the Climapod Greenhouse series and rightly so. 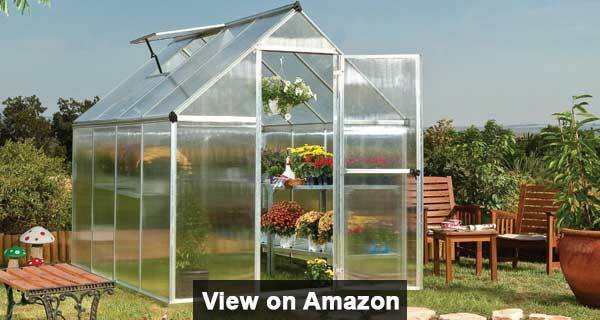 This is a sturdy, premium looking greenhouse that is great at doing its job. The greenhouse looks aesthetically beautiful thanks to the premium aluminum frame of it. Aluminum, to me, is the best option for greenhouse framing and they’ve got that is decent pricing. Good job! Overall, the construction material and engineering have made the Climapod Virtue an amazingly tough Greenhouse. I know someone who’s Climapod Virtue withstood over 70 miles an hour winds for two straight days, without getting any scar on itself. That’s really impressive. The European style greenhouse has two sliding doors with a magnetic key locker which tend to work smoothly without any complaint. It has got plenty of space in it, 124 sq. ft. in exact with a measurement of 8’9” wide x 14’2” long x 7’11” high. This will be more than enough space for any hobby gardener. This is a ‘COMPLETE’ kit that comes with 5″ base, x4 roof vents with heat powered automatic openers, x2 Solar Powered Thermostatic Ventilators, x1 louver for ventilation and 2-tier shelving on one side. For the downside, I really thought assembly could’ve been easier. With the current configuration, assembling the house is not really a piece of cake. Though you’ll need to assemble once only. The Palram Hybrid greenhouse brings you the best of both Worlds; a durable aluminum-made 6′ wide frame that is designed perfectly for your growing needs in smaller spaces, along with the precise balance of twin-wall polycarbonate covering. The 4-mm thick twin-wall polycarbonate is amazingly strong, and it is virtually unbreakable. The roof polycarbonate will block up to 99.9% of UV rays and eliminates the risk of plant burn by diffusing sunlight. The side panels made with crystal clear polycarbonate will provide 90% light transmission. The aluminum frame looks elegant and it’s rust-resistant, so it will last longer. The frame lays a strong foundation for the house combining with a heavy-duty galvanized steel base for structural support. The space inside is pretty generous but not as large as the Climapod. It offers around 48 sq. ft of growing space that I think will be enough for most hobby gardeners. If it ain’t, then you should go for any larger greenhouse like the Climapod’s Virtue Kit or Palram’s very own Hobby Series that I’m going to review below. The greenhouse helps sustainable irrigation, with an integrated rain gutter which channels the water. It has got a lockable door handle and a magnetic door catch. You’ll get a single roof vent with it that helps moderate temperature & air flow to maximize growing conditions. For additional convenience, there are 10 polypropylene-made plant hangers included with it that you can use to hang baskets or to support vine crops. 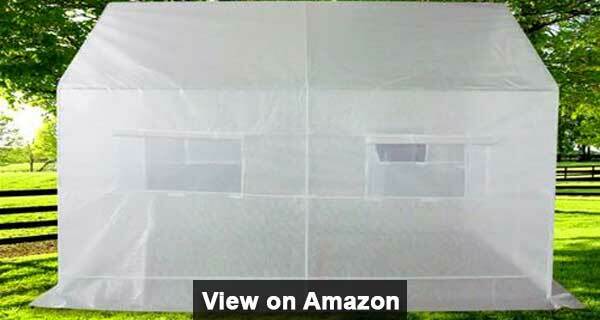 This can help to install shade cloth to the inside frame of the greenhouse as well. The assembly this time is pretty simple, not like the Climapod virtue. But your ample common sense will be needed to understand the instructions better. It’s better if you can have a helper. Expect the greenhouse to seem very flimsy until you completely assemble and anchor it. Overall, I did not find any major drawback of the greenhouse. It looks very premium and offers a lot standing at such a price point. Undoubtedly, it’s the best bang for your buck. If you’ve got your space at a premium, you might be looking for the Gardman 4-tier mini greenhouse. 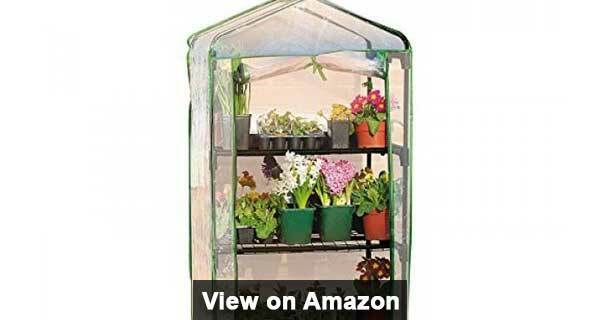 At just 27″ Length x 18″ Width x 63″ Height, this greenhouse has a small footprint and accommodates four 18″ deep shelves that offer decent gardening space for you. This is an ideal greenhouse for homes or small backyards where space is an issue. I saw that some people have used this mini greenhouse even in indoors. But you have to be cautious about the fact that this house has no floor on the bottom, so without you installing one by yourself, you might be having dirt and water all over your floor. There might not be a floor, but there’s a convenient roll-up zippered door in it for easy access. Gardeners have mentioned that the PVC used as cover in this one, does a terrific job of holding in both humidity and heat. Good thing is, Gardman themselves sale the covering of this house separately, so you won’t have to replace the whole house if the cover gets damaged for any incident. This is an ideal compact greenhouse for giving your seeds, seedlings, and young plants an early start. But this one is not for serious gardening tasks like growing in winters. It’s constructed well with a strong push-fit powder-coated tubular steel frame that is engineered for simple push-fit assembly without requiring any tools. But, not well that it can hold larger plants. This house is made for small plants and seedlings, which it can carry pretty easily. If you need to warm larger plants than that, consider investing in a larger house. If I had to ask for any enhancement on this house, I’d like to see a vent in the top of this house, this is something it lacks. Also, though it’s not too wobbly, it not super stable as well. If you buy a unit of this, I suggest you place it on something you have laying around which will help it to be more stable on the floor. You can also use hooks to zip it with any sturdy support around. If you particularly want a lean-to greenhouse then the Ogrow’s lean-to greenhouse is the best choice for this category. This will fit at the back of your house, garage, or any other structure that you want to it. This 54” by 86” lean-to house will add 25 sq. ft of growing space onto any existing structure you have. You can help protect tender vegetation and have easy access to your plants by situating your planthouse close to a building. The frame one this is made of aluminum that is 0.8 mm thick that has the support of steel base plinth. Combinedly they lay a solid, shockproof structure for the 4mm thick twin-wall polycarbonate covering that has good insulation from frost. And the whole frame has got a green coating on it to prevent it further from rusting, fading or tarnishing. Being sturdy itself along with having the support of a building or structure, the greenhouse is tougher against storms and hazards. The polycarbonate is very efficient at retaining heat so heating cost is low for this greenhouse, decreasing the size of your electricity bill. The covering can ensure an even temperature within the range of -25° to 60°C, creating an ideal growing environment. The smooth sliding door on this helps you to utilize the whole space inside the house. The roof vent ensures the constant air flow which is significantly important for successful greenhouse propagation, and along with the sliding door, it allows for full cross ventilation. And, the rain gutter is also there to allow for capture and efficient use of rainwater. The assembly takes time. You’ll need patiently follow the instruction and assemble it, only once though. For the bottom line, if you are must purchase a lean-to greenhouse, this amazing package from OGrow is a choice that you can’t go wrong about. Coming in multiple sizes, the Palram Snap & Grows hobby series can be a great choice for growing enthusiasts. This greenhouse helps your plants to harden themselves automatically from day one, which makes them tougher against the harsh outdoor environment that they have to face after relocation. This also helps to reduce the risk of losing plants after transplanting. The frame is aluminum made which gets the support of galvanized steel base. It’s rust resistant and is there to stay. Polycarbonate used on this house is made with only virgin materials that didn’t become brittle or turn colors over time, as gardeners reported. The chances of plants getting burnt inside this are very minimal, thanks to the over 90% transmission of light at 100% UV protection ability of the polycarbonate. Convenient and useful features are there. Integrated rain gutters work well to efficiently use resources like rain water. It disperses the rainwater that can be collected for a sustainable irrigation system. The roof vent and split door design combinedly ensure added ventilation by keeping the oxygen flowing. However, there are no shelves that come with the original package, so keep in mind that you’ll need to purchase them separately if you need them. Like all the other greenhouses, assembling this is not a very easy and one-person task. Though this offers SmartLock connectors that snap the frame into place and polycarbonate panels easily slide into its channels, which most of the greenhouses don’t offer. Yet you need to ensure that you install it on a leveled piece of land and a helper is there to help you out with things. Also, don’t forget to wear gloves as the aluminum frame and polycarbonate has sharp edges. To sum up, I think it’s really a great option for growing enthusiasts which has no major drawback and comes in multiple space options for satisfying everyone’s needs. If you love to have a greenhouse that comes with large, lightweight, walk-in features, this model is for you. Frames of this greenhouse are crafted with heavy duty powder coated steel. Sturdy still frames including middle rails for additional stability made this house capable of coping with adverse weather. You can strengthen further with 12 stakes coming along with the packages. The cover used in the house is UV protected, 100% waterproof transparent poly material. Premium Reinforced PE leno quality made this cover stronger than regular poly. Having features two zipped front and back door with five side vent helps to increase ventilation. On top of that, white cover has been used to increase the light reflection to give an extra boost to your lovely plants. Moreover, it has overlong cover design making the house more air light and secure. When you think of better growth of your plants, especially a bit huge plants, this house can be a good choice as the height of 7.84’ allows more space for your big plants to breathe conveniently. This house does not require heavy tools, in-depth engineering knowledge to set up. It will take just only a few minutes to install. Just bury it in the soil! However, if you have the chance to face strong wind or a bit storms very often, I would suggest purchasing additional anchoring materials (stakes, weight screws, etc.) to make your house more stable against this rough weather. Do you think something huge for your big plants? If you are planning to go with big plants in a spacious house without compromising with lightweight and durability, you should probably go with this house. 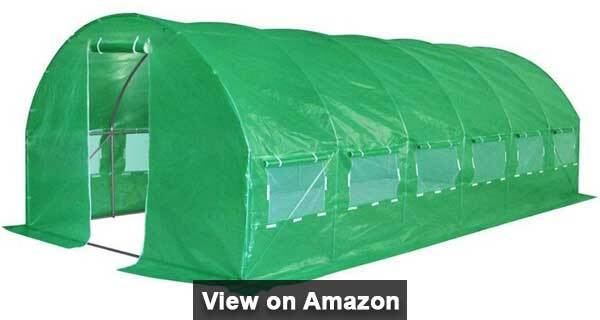 Quictent 19.7’x10’x6.6′ Portable Greenhouse is a larger house allowing your big plant to grow properly. This house has powder coated steel frame including middle rails gives additional strength to prolonging its life. On top of that, ten bases and 20 stakes are supplemented with a package which helps to increase the resistance ability against snow and wind. Improved Poly Ethylene Leno materials make the cover stronger than typical materials can prevent the covers from tearing or destruction. Not only PE cover provides a stable shelter, but also the perfect environment for your plants and herbs. Roll-up double doors including eight pcs mosquito windows keep the breeze flowing at the desired level. On the other hand, the extended cover design provides better closure with higher humidity & temperature for growing your plants and herbs. A good part of this house is that, even after being such a huge house, it takes only a few minutes to set up without using any tools. However, if there is any chance of massive wind/storm in your area, you need to take precautionary action, ie attaching extra anchor, screw, etc. Wet or windy conditions may deteriorate the greenhouse life. The Rion Grand Gardener Greenhouse is robust and ideal for the blustery, wet weather and snow load. The best part of this house is, it comes with heavy duty resin frames that withstand extremely severe winters and high winds, and they won’t bend or discolor either. It is considered as “top of the line” greenhouse as this house has been re-engineered to make heavy duty and long lasting by increasing thickness of panels from 4 mm to 6mm made of 100% UV protected polycarbonate. 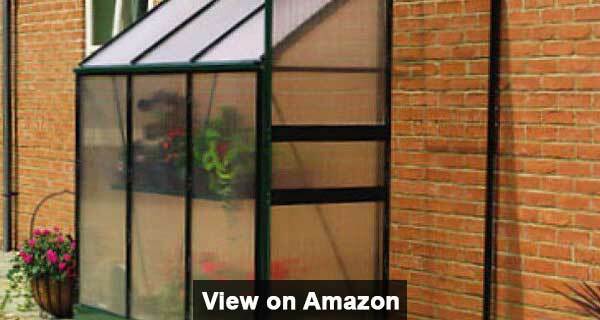 These materials make this greenhouse great providing extra durability for many years to come. A barn-style roof design carries plenty of headroom and gives you more space to your plants. You can quickly assemble using the Pin and Lock connectors, while the roof panels now merely slide into place. An optional base kit will give you a solid foundation and extra stability against strong wind. However, set this greenhouse on a concrete pad or a heavy timber foundation to withstand harsh weather and heavy snow load. However, you may find this house a bit expensive comparing with other typical styles, but when you notice the extraordinary and unique features of this house, you would agree that spending money on this model is reasonable. As a home gardener, you can be a proud guy having this beautiful Grand Gardener models- this model is not a just durable, spacious and heavy duty but also a stunning piece. Understanding the process by which the greenhouse works can help you to get the most out of your greenhouse. Greenhouses trap heat with a very basic principal. The wavelength of the heat coming from the sun is smaller, which can pass through the greenhouse covering material like glass, polycarbonate etc. The heat gets soaked up by the plants, and eventually they ‘have to’ emit it. But this time, the wavelength of the heat emitting from the plants are larger, which can not pass through glass or polycarbonate. So the heat stays, and the room stays warm, which plants love. The thing to learn here is, you can not just choose any covering material for the greenhouse that does not follow the principal. Glass, fiberglass, polycarbonate, polyethylene film all will do fine. Basically, greenhouses are 3 types. The traditional free standing greenhouse that looks like a home, the lean-to greenhouses that stays attached with any outer wall of your house, and the pop-up greenhouse that is very mobile one and can literally pop-up anywhere. The free standing greenhouses are the most commonly used type for gardening. These are like a separate house that has its own structures and covering, obviously. The most common shape for freestanding greenhouses is the A-Frame shape, followed by the round-arch shape. A-frames allow you to use glass or any other material as covering material. Whereas round-arch allows all, except glass, since they can’t be bent. Free standings one are the most expensive ones and these are for serious gardeners. 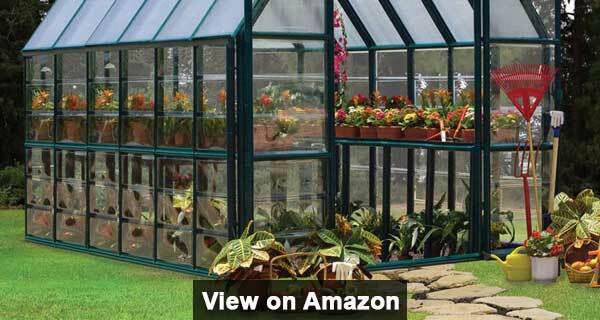 This has a professional look in itself and offers a proper greenhouse gardening environment. These are spacious and allows many plants into it. These usually have multiple bed options. But they’re usually the most expensive options as I just mentioned, both for buying and maintaining. The lean-to greenhouses stay attached with any of the outer walls of your house. These usually do not have much space in them. They’re good enough spacious to make room for a little bunch of plants, but usually not for all the plants that a serious gardener tend to have. That’s why I don’t recommend them for serious gardeners. They’re good for casual and occasional gardeners though, that doesn’t tend to have many plants. They’re usually cheaper that the traditional freestanding ones since you need less material to build it. However, sometimes it can get more expensive than freestanding ones because many people tend to use richer wooden frames to build it since it’s attached with their house and they want it to enhance the beauty of their house. They can get more efficient since they can fetch some sort of heat from the rooms of the house. But they’re not mobile at all, which may be is a downside of these greenhouses. The pop-up ones are the ultra-mobile greenhouses that look like the freestanding ones when in action, but smaller in size. You can set them up whenever you need it, and literally pack it away when you don’t need it anymore. You can also set them anywhere you feel like, and this makes it easy to get the right amount of sunlight by syncing its position with the sunlight positioning. Along with mobility and convenience and set up and set away, the pop-up ones are versatile in size as well. They come in different sizes to fulfill different expectations. They’re not a permanent addition to your home as well and you can store them in offseason or whenever you don’t need it. As expectedly, they’re the cheapest one, not by a tad difference, but by a larger margin. They’re for people who’re looking for a temporary solution for spring or fall, or for someone who’s just looking to overwinter plants by spending as less possible. Before buying a greenhouse, one of the most crucial decisions you need to make is determining the greenhouse size that you need to buy. You don’t wanna spend a lot on a giant greenhouse that you won’t need. But things get even more inconvenient if you buy a greenhouse smaller than you need since you won’t be having adequate space to grow all your plants. Now, by ‘smaller than you need’, I don’t mean your current need for space. If you buy one that has roughly the space that you need now, it’ll feel smaller after some days, I bet. Because most hobby gardeners feel the urge to add a plant or two after little intervals and not being able to do that will lead them to real dissatisfaction. So, take a life-saving tip from me, and always buy a greenhouse that is 25-40% larger than your current space need. You’ll thank me later. However, you’re yet to determine your current need for space for all your plants. First, we have to calculate that, then we can think of buying a greenhouse 25-40% larger than that. When it comes to width, you want to have 19 inches or more for the paths if you’ll be only walking through that. Make it 5-6 inches wider, around 24-26 inches if you need to bring equipment often and you get visitors often too. The width of the bed should be that much that you can easily reach standing by the side of it. This is the case where the walking path is between the two beds and you can access the beds from one side of it only. If you can access the bed from both the sides of it, means the bed is standing in the middle and there are two paths surrounding the bed, you can double the width of the bed, since you can reach to the middle standing from either side of the bed. So being able to reach the middle from both sides will cover the whole bed. The next step is deciding the length of the house. You’ll need to decide this considering how many plants you’ll need to plant. You want to keep 1 sq. foot of space for every 6” pot. And as I mentioned earlier and taking the liberty to mention again, is, buy a 25-40% larger one that the one you think you’ll need. I want to get a few extra growing weeks in late fall/or a head start in early spring: This is one of the basic tasks for a greenhouse and a piece of cake to it. How much extra time can you get with the help of the greenhouse mainly depends on your local climate? Your greenhouse features like automatic ventilation and heating are also helpful to better serve the purpose. All of the greenhouses that are available on the market can serve this purpose. If this is the reason you’re buying a greenhouse for, any basic model will do it for you. You don’t have to invest your money in any particular expensive & featureful greenhouse. 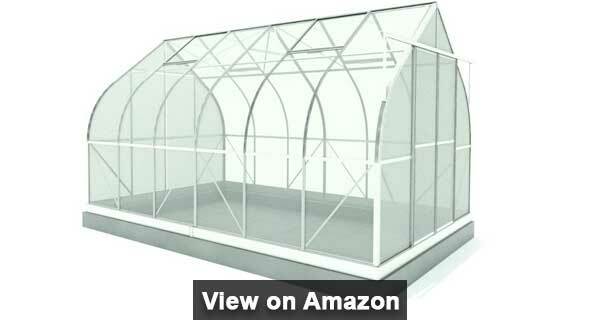 These type of greenhouses are suitable for season extending as well. Now, which greenhouse to buy depends on the temperature difference that you’ll need to maintain inside the greenhouse from outside. If you think around 30° F above the outside temperature will do fine for you, you can afford to buy inexpensive greenhouses like the FlowerHouse models. But if you live in even a colder climate where the temperature sometimes drops to 0° F or below, I’ll recommend you a greenhouse with an insulated covering. The good thing about these greenhouses is, they retain heat better as their primary job, also generally gets heated easier with less energy consumption, because of the tighter seal they have. I want my plants to grow in winter, just not survive: Plants usually need higher temperatures to grow and thrive than they need just to stay alive. So if you want your plants to even grow during winter, consider buying a premium insulated greenhouse that gets warmer and retains heat better. The models I mentioned in the previous point like the Climapod, Monticello Premium, the Palram etc are good enough for this job. Yes, they are a bit expensive, but they are worth the extra investment because of their performance and the lower heating cost. I want a greenhouse to grow plants all year round: This is a different scenario because this time it’s not only about getting more and warmer, it’s about maintaining the heat better. Yes in the winter the greenhouse will need to get warm enough to let the plants grow and thrive. But if you decide to leave them like that in the summer as well, the plants will get fried. So the greenhouse needs to be smart enough to let some heat go in the summer. That’s why I recommend a greenhouse with an evaporative cooling system to serve this purpose better. They know how to keep temperatures to a minimum when it is hot outdoors. Buying the best greenhouse is not enough, placing is crucial too. Site selection has a lot to do with the effectiveness of the greenhouse. You have to consider multiple things to choose the best location for your greenhouse While the sunlight is a major consideration, other things like availability of afternoon shade, accessibility, drainage system, water source etc. are important factors too. The best location for the greenhouse is the southern exposure. This is the exposure that gets no shade throughout the day. The next best location is the south-east or eastern exposure, followed by the south-west or western exposure. These locations get some shade in the morning or afternoon but get the daylight throughout the rest of the time of the day. The least desirable location for greenhouses is the northern exposure since this place gets some shade almost all day long, so lacks the sunlight that the plants need. Orientation is important too. A greenhouse that’s oriented east-west gets less light than the one that’s oriented north-south. Now that you know how much light you’ll get placing it where you need to know how much light you actually desire, and that depends on what you’re building the greenhouse for. If you’re going to use the greenhouse primarily for plant propagation or starting seeds and transplants in the summer, you want to minimize heat buildup. So you actually desire less light then. Try to place it in the eastern or western exposure which gets some shade during the day. If you have to place it in the southern exposure for some reason, consider providing some shade to control the sunlight amount that reaches the interior, maybe with a shade cloth. If you want to use the greenhouse for growing in winter and late, or growing your plants to maturity, you’ll want to provide it maximum exposure to the sun then. Ensure some direct sunlight every day, a minimum of 6 hours. The best orientation in such case is east-west. This helps to gain more heat from the sun during the winter and create less shadowing in the greenhouse as well. Afternoon shade from a deciduous tree is a really desirable thing for a greenhouse. In the summer, they can shade the greenhouse during the hottest part of the day. And in the winter, the leaves will fall and the greenhouse will get the extra light that it needs during the winter. Though, be aware of placing the greenhouse very close under the tree. There’s chance of falling branches that might damage the house. Place the house adjacent to the tree, but not too close or directly under it. If natural afternoon shade option is not available, you should put the effort to manage artificial shading only for the afternoon. Accessibility and Utility Supply: You want to make sure that your greenhouse is easily accessible. Don’t forget that you’ll need to move fertilizer, soil, plants, and yourself obviously, to and from the greenhouse. The more accessible it is, the easier your gardening life will be. A good site for your greenhouse should be sheltered from high winds and easily accessible for you from both your home and garden. Access to utility supplies like water and electricity are important considerations too. You want to select a site where you easily can ensure fluent water supply. Also, make sure the electricity line reaches there easily too. You’ll need to run fans and provide artificial heating in need. Last but not least considerations are good drainage system and a possibility of storm damage. Just like you ensured water comes in easily, in the same way, ensure it leaves the place easily as well. If water stays stuck within or around the house, the plants will not be really happy with it, as it can damage them and create a mess in their house. And greenhouses are prone to damage caused by natural storms. So select a site where the impact of the storm is not severe and you can take quick action to the house in an emergency. Not surprisingly, the materials used to manufacture a product plays the most important role in its performance. But in the case of greenhouses, the manufacturing element is not only about performance, but also functionality. That said, there are no certified ‘best’ materials for greenhouses. There are so many materials that are required to build a greenhouse, so it is hard to know what’s best. Aluminum, wood, galvanized steel, PVC, fiberglass, glass, polycarbonate, polyethylene etc. all have their own place in the construction of a greenhouse. So it’s your budget and functionality needs that will determine which is best for you. The most important thing for a greenhouse is covering which determines the amount of light that’ll go through to your plants, and the amount of heat the interior will retain. Additionally, it’s responsible for how your greenhouse looks, it’s security and longevity, ease of maintenance and so. There are some common materials that are mostly used for greenhouse covering, like glass, fiberglass, polyethylene, poly-carbonate etc. Each has their own advantages, disadvantages. Let’s see what those are. Glass is the most traditional greenhouse covering, which is mostly preferred for its permanence and beauty. A glass covering is likely to serve you more than 25 years if not accidentally broken, twice as more as any other covering material. Glass is not really amongst the most efficient materials for retaining heat, because it transmits heat and gets cold quickly, and has a very little insulating value. Greenhouse glasses need to be double or triple in strength to increase the heating efficiency of it and decrease breakage chances as well which may occur when installing, and in a completed greenhouse as well. The glass is the heaviest material amongst the ones that are used for covering, so it needs more substantial framing. The frame needs to be really sturdy to hold the glass covering. There are other disadvantages like they don’t diffuse light, so there can be a risk of burning plants. They’re more likely to break than plastic covering as well. This is a considerable issue if you have kids playing basketball nearby, trees nearby etc. And installing glass is not a piece of cake as well. Slight deviations from vertical and horizontal frame alignment or settling of the foundation may crack it. If you’re not really confident about your talent in building stuff, you might avoid glass as the frame needs to be very square and rigid at the very first place, and you have to place the glass in them very very carefully. If you still want to have glass material for its beauty or any other reason, consider hiring an expert to take care of the installation. The distinct advantage of plastics like fiberglass, acrylic sheets, polycarbonate, and polyethylene film is that they’re shatterproof, and they resist hailstone damage. Also, their flexibility helps a lot. You can flex them to fit over a curved surface, which lets you design the frame in rounder shape if you need. And they are available in large sheets, which reduces the possible number of joints in the covering and ultimately reduces the possibility of air leaks from joints. Fiberglass: Fiberglass is considered to be the first of the practical replacements for glass. They come in corrugated sheets or rolls usually. Fiber Glasses are translucent rather than transparent. They’re see-through so you can see through them but the light transmission is lesser than glass. Fiberglass creates a virtually shadow less greenhouse by diffusing light that passes through it. They’re more efficient at retaining the heat than glass, but not as efficient as insulated plastics like polyethylene film or polycarbonate. At the same time, they transmit less heat into the greenhouse which helps in both winter and summer. The fiberglasses used in Greenhouse is UV protected by a coat of some sort of gel that eventually bakes by the sun lasting roughly about 6 years before turning yellow. After this time period, fiberglasses become very unsightly as dirt accumulates among the glass fibers. Polycarbonate: Polycarbonate is one of the latest covering options for greenhouses. The UV treated polycarbonate offers multiple benefits, as they provide much of the clarity of glass and in the same time, they’re stronger, so more resistant to impact than other greenhouse coverings. Also, they’re more resistant to even fire than other plastics. Polycarbonate for greenhouse covering is available in different thicknesses. Usually, you’ll find single, double, and triple walled sheets. They’re different in terms of the amount of heat they’re capable of retaining, so in terms of price, so you can buy according to your needs and budget. As you can guess, single wall polycarbonate is the most affordable option among all the available versions. This type of polycarbonate is mostly used for its attractive appearance. But since it is single layered, it lacks heat retention abilities, the strength, and light diffusing properties of multiple wall polycarbonates. Multiple wall polycarbonates are more expensive and come with better properties. They minimize shadow that is optimal for growing plants as they provide your greenhouse with an even diffused light. They also retain more heat, are stronger against impacts. They’re cheaper in such sense that heating costs get lower with them. So if you’re in cold climates that need frequent heating, these expensive multiwall polycarbonates will pay for themselves. Polycarbonates are more durable than fiberglasses. They offer up to 15+ years of lifespan. Though it is still not much as glass, it’s a great number considering how lesser they cost than glass. Polyethylene Film: Polyethylene film happens to be the favorite of commercial growers because of its simplicity of maintenance. Use it without any hassle for 3 to 5 years then reinstall new poly. The lifespan of polyethylene depends on the poly thickness and UV treatment used though. A difference in these properties also creates a difference in the lifespan of it. Single layer polyethylene film is good for simple cold frames. These type of covering is best suited for greenhouses that are used for starting seeds and other seasonal needs. In the case of using polyethylene with multiple layers, the space between them is usually inflated by a fan that creates insulated air space. A double layer polyethylene film is more efficient in retaining heat that glasses, which saves roughly 40% in heating costs. For the downside, polyethylene has a relatively short lifespan than other greenhouse coverings. They’re also more prone to rips and tears and have a translucent appearance much like fiberglass. Despite these drawbacks, a Polyethylene’s low cost, efficient heat retention, high light transmission, ease of replacement have made it a favorite greenhouse covering option of commercial growers and nurserymen. All the polyethylene films are not great for greenhouse covering though. Polyethylene sold in many hardware stores are cheap and thin, which is not the best suit for greenhouses. Polyethylene films that are made for greenhouses are specially coated for protection from UV (ultraviolet) rays, as UV harms unprotected film and make it last shorter. These polyethylenes have a little cost difference than normal films but influence a considerable difference in performance on your greenhouse. So make sure you buy the specialized ones made for greenhouses. The common materials for greenhouse frames are galvanized steel, aluminum, wood, plastic etc. Just like the covering, they have their own advantages and disadvantages, and there’s no considerable ‘best’. It depends a great deal upon what covering you want to use, for how long you want to use it, and where and how you will be using your greenhouse. Galvanized Steel: Like the polyethylene films, galvanized steel are favorite of commercials for frame material, as they are low in cost, comparatively longer lasting, and they require less framework (thanks to steel’s natural strength), which ensures less shadowing. The greatest value Steel provides in greenhouse construction is its strength. Due to its natural strength, it requires way less framework and they can afford to be thinner as well, so they ensure minimal shadow and maximum light entrance. Another major advantage of galvanized steel is its low cost. So if you buy any steel tube greenhouse, make sure the steel is heavy-duty galvanized steel or stainless steel tubes that’ll protect it from normal humid and corrosive (fertilizer salts) atmosphere of a greenhouse. Aluminum: Aluminum is the most expensive, and most beautiful and sustainable framing option for greenhouses. They have a higher initial cost, but they pay for themselves later with the premium look and longest possible lasting as they’ll never rust, rot, or break down from UV rays. Aluminum promotes much more sturdiness in the frame as well so they can adopt a rigid and weighty covering option like glass. Usually, these two materials, aluminum, and glass are often used hand in hand to construct the premium greenhouses like Monticello. Though aluminum frames are sturdier in a whole, they do not have the natural strength of steel. So it usually requires more bars or parts to build a total frame, which creates a little more shadow inside the greenhouse, as a minor downside of aluminum as greenhouse framing material. Try to look for engineered shaped aluminum bars that are designed to increase frame strength, without much more parts needed. Wood: Wood is most commonly used in homemade greenhouses. Nice finished woods bring a very attractive look to the greenhouses. Also they lose less heat comparing to a similar size metal frame. Wood frames are often covered with rigid plastic covering. Though a sturdy wood frame can take the load of a glass covering and looks premium together. Due to a greenhouse’s damp atmosphere, wood frames tend to have a limited lifetime before it starts to deteriorate. If you want to use wood for the framing, I recommend Redwood or Cedar as they have a natural resistance to the elements and insects. I also recommend applying a chemical sealant or stain to the wood periodically as that can help greatly to increase the lifespan of the wood. Since wood frames tend to be heavier and larger compared to equivalent metal frames, they tend to block the light a bit more and increase the amount of shadow, which is not desirable. You’ll have to live with this drawback if you’re fond of the attractiveness of wood frames. Plastic: Plastic has grown in popularity as a framing material over the last 10 to 15 years. They’re low in cost, they’re portable and they are very easy to install. But plastic is not as rigid as wood or metal so they’re usually used to construct smaller structures that don’t require a lot of strength. Though metal wire supports tend to compensate for what plastic lacks in strength. Since plastic is even a poorer conductor of heat than wood, they lose a lot less heat comparing to a metal frame, which is a great advantage to get. Plastic is pretty vulnerable to ultraviolet rays which emerges as a major drawback of it. The UV rays coming from the sun will eventually cause the plastic to deteriorate. Even the UV protection tend to not work so well, though better than no protection. A plastic material that is protected with UV usually has a roughly 20 year of lifespan, which is not really bad. Another drawback of plastic is they influence a larger shadow as they are larger in size than equivalent metal or wood frame. That was a long piece, wasn’t it? I had to put a lot of efforts to write this one but I loved every bit of it. Since gardening is something I’m passionate about, writing anything about gardening feels like a breeze to me. About picking the best-suited greenhouse for you, I again want to remind you that it’s more about understanding your needs and expectations from the greenhouse, than the house itself. All the houses I recommended above is great, but not ‘best’ for ‘everyone’ out there. They all kind of falls in the same category in terms of build quality, features, assembly etc. Almost every house has got aluminum made from, most use polycarbonate for covering, and assembly is not really easy for none of them. What’s the difference then? Everyone has their own best usage. One’s for entry level gardeners, one’s for seeds and seedlings, one’s for joining with your house and so on. You need to understand which you need. That’s the secret for picking the best greenhouse for yourself. By the way, doesn’t that mean this high-quality aluminum framing, great polycarbonate covering is there in every other greenhouse? Not really. There are greenhouses that claim such in the advertisement but does not stand up to promises in reality. That’s why I handpicked these models from every category that are true to themselves. Judging the quality of the materials and the overall engineering of a greenhouse is important too, alongside knowing your purpose. That’ll be all from me. Stay tuned for the next piece. Best Kids’ Wheelbarrow – The Best for Your Superhero!